List of Medical Colleges In Chhattisgarh: Here is the list of total medical colleges in Chhattisgarh that are going to participate in National Eligibility Entrance Test (NEET (UG)) counseling 2017. Below we have listed some other colleges for different courses. NEET 2017 state quota counseling will be started after the NEET Result announcement. All candidates who belong from Chhattisgarh state will pe able to register themselves for State Quota NEET Counselling 2017 In Chhattisgarh state. The state quota counselling schedule will be announced soon by the officials. Candidates are advised to keep checking this website for more updates regarding NEET 2017 Counselling and Result. 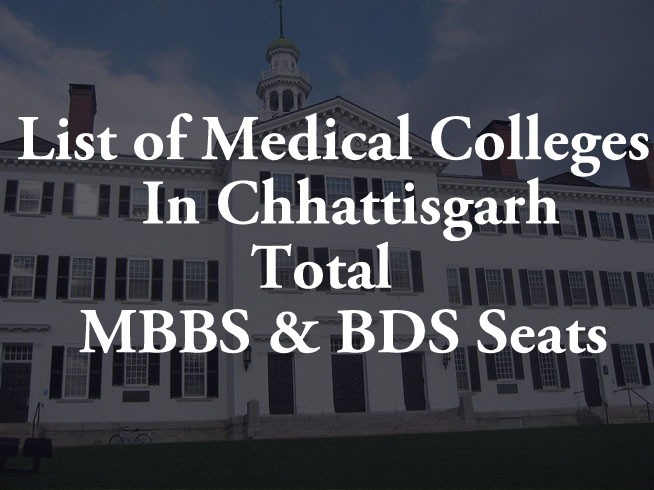 Chhattisgarh Institute of Medical Sciences, Bilaspur Guru Ghasidas University Govt. 2001 0 Recommended for withdrawal of recognition.